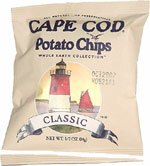 They have the same great taste and texture as the regular (non-Whole Earth Collection) Cape Cod chips. Aside from the beige, non-metalic bag, I'm not sure what makes these different. Smell test: Nice light, potatoey smell.